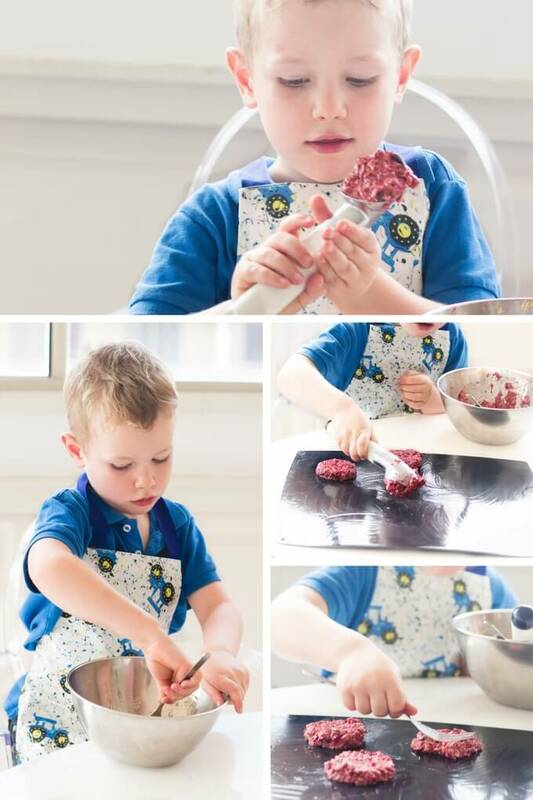 Raspberry Banana Cookies, made with only 4 ingredients, is a great recipe to make with kids. Sweetened only with fruit they also make a perfect baby-led weaning snack. I love cooking with Finn and one of my favourite recipes to make with him is banana oat cookies. They are perfect for adapting, you can just alter the recipe depending on what you have in the house to use up. As long as you have the banana and oats as your base then you are sorted. 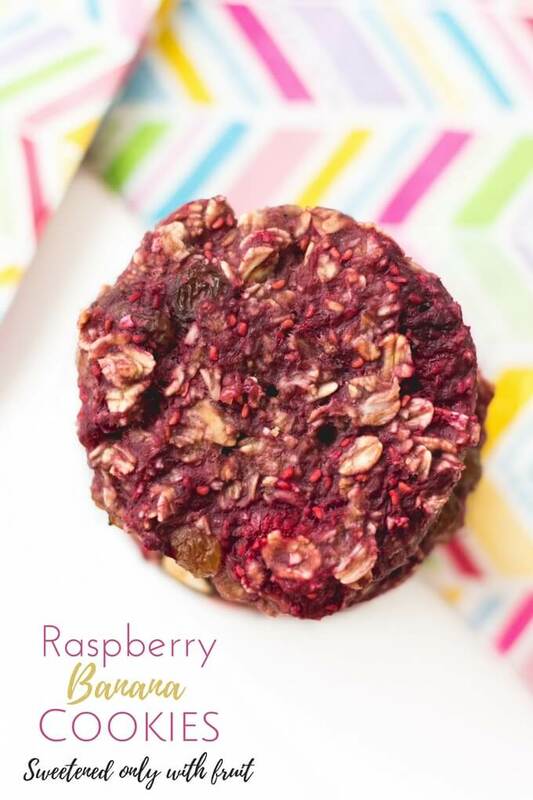 This week we made a raspberry version using only banana, oats, raspberries and sultanas. The reason I love this recipe so much is that it is so easy for kids to make themselves and you don’t have to worry about them eating half the mixture before it is cooked (as my boys do every time). For younger kids, you can measure out all the ingredients in cups and just get your kids to mash, tip the ingredients into the mixing bowl and mix. For older kids you can get them to measure the ingredients themselves using the scales. Finn loves this and it has been great for his number recognition and is helping him start to build his understanding of place value. These banana raspberry cookies are so quick to make. The first thing I do is pop the sultanas in a bowl and cover them with boiling water. I let them soak while I make the cookies and then drain them at the end, just before adding them to the mixture. This makes the sultanas plump and juicy and stops them from burning. I don’t recommend skipping this step as a burnt sultana has a bitter taste and is sure to put the kids off! These cookies are so soft, making them perfect for kids and for baby-led weaning. They are great for breakfast, as a snack or to pop in a lunch box. 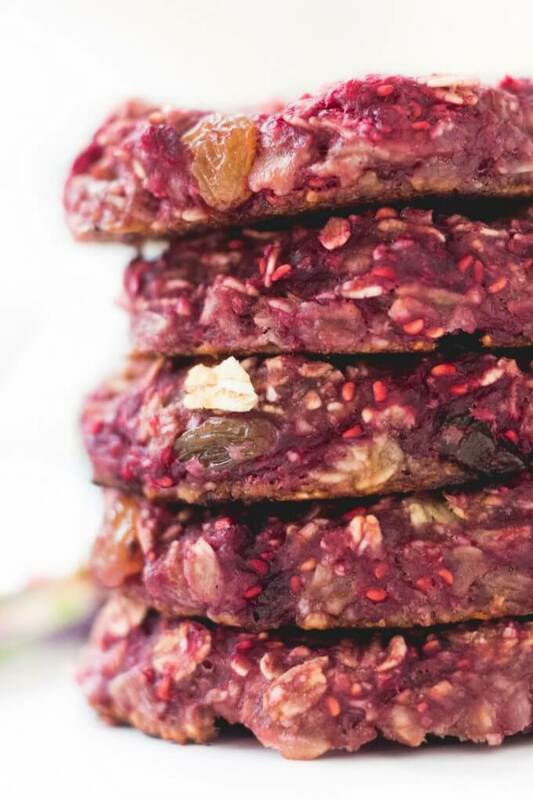 Soft raspberry, banana oat cookies. A healthy kids' snack and great for baby-led weaning. In a large mixing bowl, mash the bananas to a puree consistency. Add the oats & cinnamon and stir through. Add the raspberries and stir until the raspberries have broken down and incorporated into the mixture. Drain the sultanas and add to the mixture. Flatten the balls to form cookie shapes and cook for approx 15 mins. Excellent recipe! So easy to make and yet so tasty. I love that it does not call for sugar. Perfect for my little one. Thank you for sharing! Hi Citra, sultanas are dried grapes – similar to raisins. Are they necessary? Could make the recipe without? Not necessary at all, I often make them without. They are just in the recipe to add sweetness. Can I use fresh raspberries rather than frozen? Hi Amy, thanks for your recepies! This one taste also very good. Just perfectly enough sweet! I have put some more oats, my dough was to wet. Hi Zsofi, thank you. It is so lovely to hear you are enjoying the recipes and thanks for taking the time to give feedback. ? I love this recipe and would like to make a bigger batch but has anyone tried freezing these? Hi Anna, yes you can freeze them. So glad you enjoy the recipe. ?? Hi Niamh, are you doing baby led weaning? If you are doing purees I wouldn’t recommend this at such a young age. I personally didn’t give anything like this until a little older as I tried to minimise the sweeter foods. I did make porridge fingers (https://www.healthylittlefoodies.com/porridge-fingers) but without any dried fruit. Could you use blueberries instead of raspberries for these cookies? Hi Jo, I’ve never tried blueberries but this recipe is pretty flexible so it would totally be worth a try…let me know how they turn out! I used frozen forest fruits instead of raspberries because I happened to have those in the freezer and they worked fine. Great! I’ll try that next time! Ive made these with blueberry’s and they are lovely! Yummy, did they go a lovely purple colour? Hi Phyllis, the recipe is at the bottom of the page. You will need 2 ripe bananas and 1 cup (95g) oats. Can quick oats be used? Hi Kim, I’m not sure how it would work with quick oats. The cookies gain all their structure from the rolled oats so I am unsure how they will hold up with quick oats. You wouldn’t need as long to cook and would maybe need more quick oats to soak up the moisture. Let me know if you try it and if it works…! I used blue berries instead of raspberry, cameout nutri delicious. Thanks for the recipe. Hi Mary, so glad you liked them and I’m loving the sound of the blueberry version – I’ll try that next time. Did they have a lovely blue / purple colour? Hi! We love this recipe. Just wondering, do they keep better in the fridge? Have been keeping them in a sealed pyrex at room temperature so they dont get too hard, but find they take on a funny smell. How long do they keep? Both my 3year old and 1 year old absolutely LOVE these. My eldest has loved getting involved and making the mixture turn pink! Great! Glad they were a hit with your kids and I love the addition of coconut flakes – yum! Today I omitted the Saltanas because we only had a 20min window … it took less than 5 min to have them on the oven tray how amazing is that! Thanks Cassandra, I love how quick and easy they are too! Looks delicious! I’m thinking of making these with my cooking class with my kids at school. How many servings does one recipe make?? Hi Sammi, I love that you are making this with your class at school. I can’t actually remember how many they make, I’m sorry. I’m actually trying to go through my recipes to check all these details and update the recipe cards. Hi Charlotte, I have only tried these with the banana so can’t say for sure. The banana is used for binding the oats together and also for sweetness. I wonder if apple sauce / puree would work..? how many cookies come out from above recipe as you dont state servings! looks yummy – thank you!! Do you think i can use fresh strawberry? because finding other berry is very hard at my place. Hi Sandy, Strawberry should work, the colour won’t be as vibrant though. I make these with a variety of different fruits, the recipe is very adaptable. How many cookies did this make? Looks like a great recipe! Hoping to try it with my school cookery club! I’m so happy that you are making these with your school cookery club, I love kids getting involved with cooking healthier food. I can’t actually remember how many these make, sorry. I am slowly going back through my old recipes to update this information but haven’t got to this recipe yet.